RAF Squadron Leader, Marmaduke Pattle, who was given the nickname of “Pat”, was born on July 3rd, 1914. His aerial victories (confirmed and unconfirmed) are over 50 and the confirmed over 40. Of those, 26 were Italian and of those, 15 were recorded as he was flying the Gloster Gladiator. A genuine gladiator himself as was his plane he fought against his Axis counterparts and at the end, against disease and the hardships of war. He was declared as the Gladiators’ and Hurricanes’ top ace of WWII. Pattle was born in South Africa, the son of English immigrants. As soon as he finished school he enlisted in the South African Air Force (SAAF) but in 1936 was transferred to the RAF. Upon completing his training as an operator, he was placed in the 80th Squadron which had just received its Gloster Gladiators. In April 1938, 80th Squadron transferred to Egypt. It was there that for the first time his capabilities as an aviator and his natural talent as a marksman were noticed. It was there however that his love for the air force was also confirmed which was translated into hard work and effort to improve those two talents. Many would have been complacent, but he wanted to continuously improve and get even better! With the outbreak of the war, Pattle’s Squadron was transferred to the borders of Libya, over which he first saw action in August of 1940. The “B” flight, which Pattle led, was moved to Siddi Barani. Until August 4th, 1940, in the air battles above the North African sand, Pattle had 4 shot down and one unconfirmed victory. On August 4th, the Italians fought fire with fire, but he managed to escape without sustaining any injuries. That day, they were escorting a Lysander, when the British came face to face with six Breda Ba.65 of the 159 Squadrilia and as many CR-32 of the 160 Squarilia. From Pattle’s shots, the Breda made a forced landing and one of the Fiats fell spiralling out of control and the sky. After avoiding multiple attacks from Breda’s and CR’s, Pattle was forced to abandon his aircraft when he came under fire from Franco Lucchini – an ace, veteran of the Spanish civil war – and his rudder was destroyed. It’s not necessary for us to note once again that the Italian pilots had the tendency to fly and fight in packs, something that they proved many times in the Albanian theatre as well. Pattle walked till the border and two days later was picked up by a detachment of Hussars, who then took him to Siddi Barani. 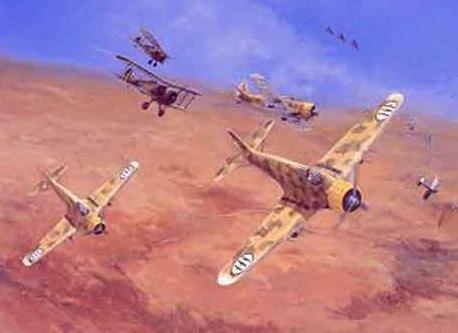 On August 8th, leading 14 Gladiators versus 16 CR.42 of 9 and 10 Gruppo, Pattle brought down two more aircraft. Almost a month later, Pattle was promoted to first Lieutenant. In November, Pattle’s Squadron was moved to Greece to reinforce the RHAF against the Italian invasion. It was this battle field that was destined to do him honors and make him the legend he is today. On November 19th, still with the Gladiators, Pattle and 8 of his pilots of the 80th Squadron attacked CR-42s and the G.50s in the area of Korytsa. In the air battle that ensued, Pattle accounted for two of the eleven (9 confirmed and 2 possible) in total British victories. 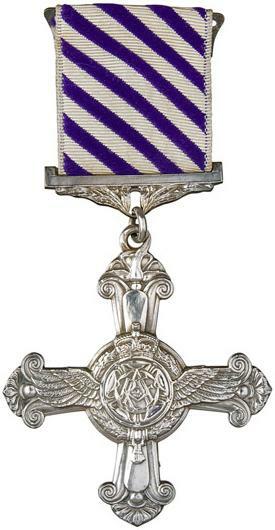 On February 11th, 1941 – the day that Bardavilias Anastasios was killed – Pattle was awarded the Distinguished Flying Cross. Up until that point in the war, he was Britain’s top ace. What’s more, he had achieved that with the British outdated biplane, the Gloster Gladiator! On March 18th, 1941, Pattle received the DFC a second time as with three Italian fighters shot down over Chemara, he had raised his total score to 23. Pattle served with the 33rd Squadron in March and April of 1941. On his first contact with the Luftwaffe, on April 6th, Pattle shot down 2 Bf-109E’s of JG27 in the battle of the forts, in Rupel. In April, Pattle fell victim of the flu and his health condition had reached such a low point that his acting commanding officer, Squadron Leader Jones, gave him a direct order not to fly unless the sirens notified of an air invasion. An order which Pattle very willingly ignored and despite his high fever (39 degrees Celcius), shot down 9 aircraft in 4 days! On April 20th, the day on which he flew for the last time, taking part in the aerial battle of Athens, the last 12 fighters of the RAF in Greece, took off in a desperate and almost defiant interception mission of the German aircraft. Roald Dahl, a pilot of the RAF at the time, mentions that 5 Hurricanes were shot down with 4 of the aviators being killed. One of them was Pattle who had taken off despite his having still a high fever, due to the flu! The 3 out of 5 aerial victories of the Luftwaffe are credited to Gustav Rödel, one of the most successful Luftwaffe aces of WWII, even though Pattle’s kill was shared by two Bf-110’s of JG26. What is amazing about Pattle’s score is that it was recorded in a time frame of 9 months, which in itself unavoidably leads us to the question: had he not have taken off that day and Pattle continued on in the war, how much would he have reached? Pattle is remembered highly as an excellent marksman, an extremely good aviator and a very good leader. As a leader he was always demanding much more from himself than his men and it was said that even though he was supposed to be “in bed”, he insisted on leading his men! Even though we will never know Pat’s exact number of kills, it is for a fact that they are over 27 and count between 27 and 44, without being quite able to exclude that they actually did reach 50. Regardless the exact number however, the Squadron Leader is the greatest biplane ace of WWII and one of the greatest Hurricane aces of the war. It is possible that he is the best RAF ace of the whole war. He claims the largest number of kills (confirmed and unconfirmed) but as we said before, we will never know for sure the grand total. ΑΝΔΡΩΝ ΕΠΙΦΑΝΩΝ ΠΑΣΑ ΓΗ ΤΑΦΟΣ – EVERY [PATCH OF] EARTH [CAN BE] A PROMINENT MAN’S GRAVE!